My cousin had her rehearsal dinner a few months ago at Aldo's Organic Restaurant in Baltimore. This restaurant had a great organic menu of Italian food and is located in a great neighborhood. 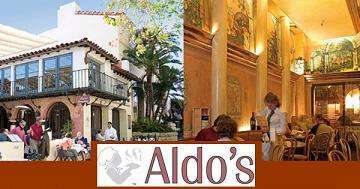 My family are very big fans of Aldo's so we've frequented there often and love their salads and pastas. The food is always cooked to order and very fresh. For the rehearsal dinner since we didn't have a set menu, we decided to each try something different. I chose to have the Jumbo Gulf Shrimp Scampi with garlic sherry butter in seafood risotto. My husband chose to have Amish Chicken Tenderloins and Artichoke Hearts sautéed in a garlic butter sauce. The food tasted very fresh, we were very pleased. For all you wine lovers, you will be very impressed. They have a great wine list featuring numerous different wines. I highly recommend this organic restaurant. They start serving dinner every night around 5pm, the dress code is business casual and you can make reservations online if you want which is a nice added feature. They have several different dining rooms all having a different theme. Great Sage Organic Restaurant - Great Food! Great Sage is an all organic restaurant with options for all kinds of eaters (vegan, gluten free, and even peanut or soy free). It's located in what's known as the "Conscious Corner" in Clarksville, Maryland. It's right next to Roots Market, whose owners established Great Sage, which conveniently provides most of the fresh ingredients on the menu. I used to work at the market, so I know that the owners take their business and its ethics very seriously! All the food I've had at Great Sage has been delicious, and it is nice to know exactly that your food is coming from- right across the street, literally! Also, because of the close relationship between all the stores owned by Roots, the people serving your food are very knowledgeable about the items on the menu. If you ever find yourself in Clarksville, do your self a huge favor and visit “Great Sage” organic restaurant. You will be more than glad you did…….